The Supremes in multiple iterations play an important role in Cusp. They're the only artists Mark needs to get by, and because she really, really likes him, Karen tries to get on board. He holds a series of listening sessions that explain to her the group's shifting members, the role of Berry Gordy and Holland-Dozier-Holland, and the impact of Diana Ross' departure. In Chapter 9, Karen says, "I’m being indoctrinated, and I do like the music but it’s not exactly realistic. Take 'I’m Livin’ in Shame.' Apparently Diana Ross’s 'Mama' is an embarrassment who dresses in rags and eats her food right out of a pot, with her hands. Diana ran away to college and told everyone her mother had died, so imagine the guilt when Mama dropped dead while baking bread. Whew!" 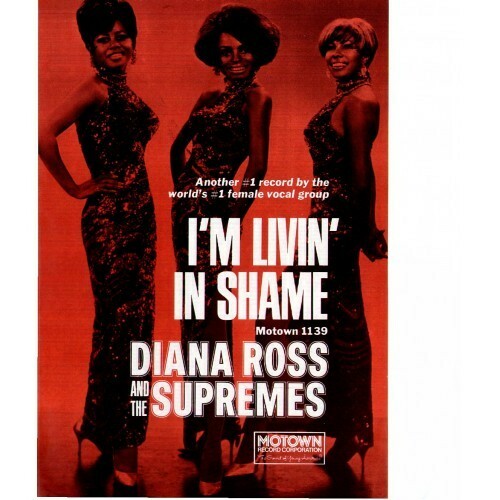 "I’m Livin’ in Shame" by Diana Ross and the Supremes followed the number 1 hit "Love Child" in 1969, but only made it to number 10. Cusp Song of the Day: Why Can’t We Be Friends? Cusp Song of the Day: Is That All There Is?